Our team can provide you with audio systems solutions tailored to your requirements and your needs. We are happy to design the best solution for you by upgrading your existing equipment or by providing you with a brand new installation. 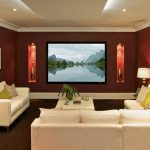 We can help you create the perfect home cinema whether it is for your lounge room or for a specific dedicated area, we can wire and connect your devices in the best and most modern way. We can provide you with ideas and solutions to achieve the maximum connectivity for your devices.